Have you ever looked at a beautiful bench in a city park or a neighbor’s garden and thought to yourself, “I could probably make that”. Chances are, you were right! Making your own DIY outdoor bench actually may be easier than you think. There are tons of tutorials that you can find online. The good news is that many of these tutorials don’t even require complicated building plans.There is a DIY outdoor bench for every skill level, so even if you are just a beginner you don’t need to worry. All it takes is a little creativity and willingness to try something new. You can build a bench from scratch, or even upcycle some furniture from inside your home. This article will inspire you with a list of outdoor benches you could easily DIY if you are looking for something to make this fall. If you like a little challenge, you should choose to go the ‘building your own DIY outdoor bench from scratch’ route. This fun project can really push your creativity. To create a simple bench for your garden, you will need to gather some tools. A miter saw, cordless drill, a pair of 18 inch clamps, and sandpaper are all helpful when building a bench. For building materials you will probably need a few sheets of cedar deck board, a box of screws, and wood glue. Can you believe that’s it! You can whip up a beautiful DIY outdoor bench in just one afternoon following these step by step instructions for this deceptively simple bench. Finish the bench off with a little sanding and a few coats of finish or your favorite outdoor paint. For a more industrial looking bench considering making a bench from your garden using concrete or cinder blocks. Concrete or cinder blocks will hold up really well to all kinds of weather exposure and can work great as a base for your bench. In just under 30 minutes you can stack up some cinder blocks and slide a few pieces of 4x4x8 lumber through them to create your DIY outdoor bench. This quick and easy job can be used to add easy seating for your next outdoor BBQ or fire pit. For an added bit of fun, consider painting the cinder blocks a bright and bold color. You can also sew up some pillows for your bench. Just don’t forget to bring the pillows inside so they don’t get wet. This bench is quick and easy on you and your wallet. The best part of building something yourself is that you get to customize the project to fit your needs. Not to mention that it is cool to have something you have made with your own hands. Did we mention that DIY projects can also save you tons of money? This beautiful DIY outdoor bench project checks all of those boxes: customizable, affordable, and something you can truly be proud of. You can build this bench for under $40, but it would cost you HUNDREDS of dollars to buy a comparable bench in stores. With just a few 2×4 pieces of pine and a little liquid nails you can have a bench that you will love to use sitting in your garden. Not to mention you can use all the money you saved by building your own bench to really make your garden something to be proud of. If building a DIY outdoor bench from scratch isn’t on your list of projects, you should consider upcycling your bench from furniture you may already have. Bringing old furniture outside and transforming it into a bench is a great way to recycle old furniture and give it new life. There are quite a few possibilities in upcycling. Below are just a few of the ideas we found that will really get you inspired. One of the most common bench upcycle projects we found was turning old chairs into benches.. The basics of this project call for 2 wooden chairs, screws, wood glue and extra lumber. You can either set them up together, to create a back for your bench, or you can set them up facing each other. Setting them up facing each other kind of frames the bench in a different and unique way. Keeping the backs and the feet of the chairs intact, you then take off the seat of the chairs. Using simple pine wood you can build a frame for the new seat of your DIY outdoor bench. You can fill that new seat for your bench in completely, or just with wooden slats. Top off your project with a coat of fresh chalk paint and you have a brand new bench made of old kitchen chairs. Another great upcycle project for an outdoor bench is using a bed frame. 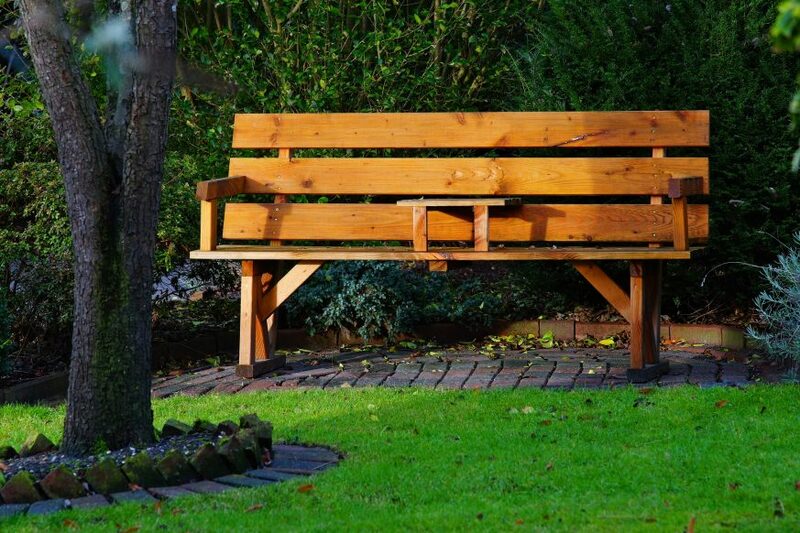 If you have an old wooden bed frame you are ready to toss, consider tossing it into your garden as a new bench! Like the kitchen chair upcycle, using a bed frame is easy because it already has the majority of the structure built. This means that it is already fairly stable and secure. All you need to add to make your bed frame into a bench is the seat. While most of the upcycle bed frame projects I saw used a twin size headboard and foot board, there is no reason you couldn’t use any size. In fact, I saw quite a few tutorials that used the sides of a crib to build a DIY outdoor bench for their gardens. A wooden pallet is one of the easiest materials for a DIYer to work with. There are so many projects you can upcycle a wooden pallet into. Luckily, turning a wooden pallet into a DIY outdoor bench is quick, and easy. Not to mention that it looks great! If you do not have a pallet laying around your home or garden to use, try checking craigslist. There are plenty of pallets for sale. You should just make sure that the pallet is in good condition, and there are no signs of rot. Finish your bench off with a good quality coat of paint to keep your DIY outdoor bench looking great all year long! Making a perfect DIY outdoor bench can be easy and fun. Once you have made a your own bench you can find the perfect shady location to turn into a relaxing paradise in your own backyard. A bench will be a great addition to any garden. You will wonder why you didn’t make one sooner!